Timothy P. Maloney’s practice entails all aspects of intellectual property enforcement and defense, with an emphasis on representing patent owners in patent litigation and licensing. 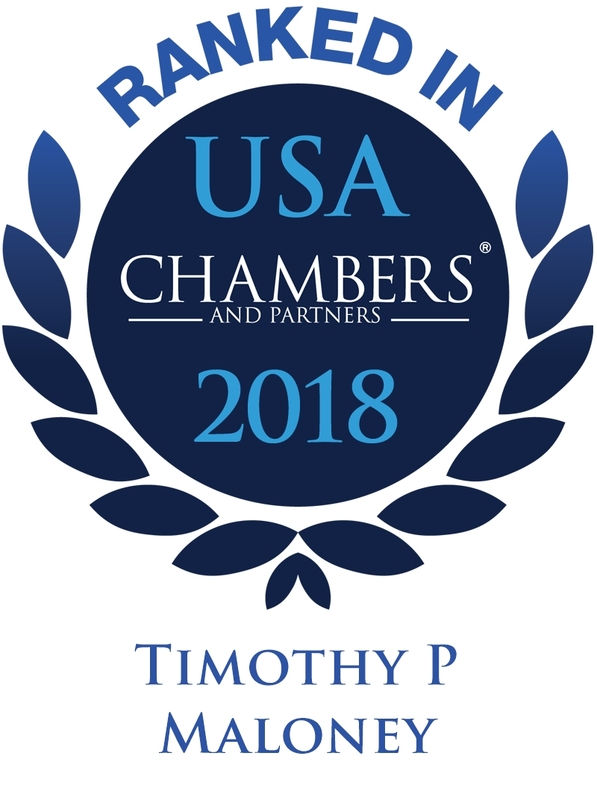 Tim has achieved a strong record of courtroom success and is established as an effective trial lawyer and negotiator against top lawyers from the nation’s largest law firms. Although his primary focus is patent litigation, he has also successfully litigated disputes regarding trade secret, antitrust, trademark, unfair competition, and professional malpractice matters. Tim has developed particular expertise in multi-party, multi-forum, complex patent litigation. He has served in first-chair and second-chair roles in numerous successful jury and bench trials. With claim construction at the heart of most patent disputes and critical to accurate patent analysis in all contexts, Tim is regularly tapped for his experience in this area, developed from lead counsel roles in many dozens of claim construction proceedings and Markman hearings. Tim also handles appeals and has successfully argued several cases before the U.S. Court of Appeals for the Federal Circuit. Tim has a keen interest and deep experience in IP monetization strategies and programs. 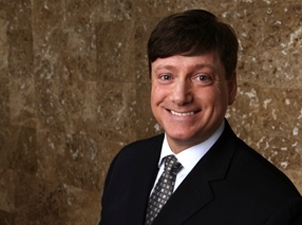 He has been instrumental in the firm’s contingent-fee litigation and technology licensing practice, which has helped numerous smaller businesses and entrepreneurs to enforce and monetize their IP rights, collecting substantial verdicts, settlements, license revenue, and portfolio sale proceeds on their behalf. In high-stakes patent post-issuance proceedings, such as reissue, reexaminations, inter partes reviews (IPRs), and covered business method patent reviews (CBMs), representation by a legal team with both USPTO and litigation experience is often the ideal. Tim has had a primary role in over 100 such proceedings emanating from high-stakes patent litigations, developing a notably strong track record. Tim was recently recognized in an independent study as the #3 best-performing attorney representing patent owners in IPR proceedings. His contributions have helped position the firm as one of the top 5 performing law firms representing patent owners in IPRs, as reported by Intellectual Asset Management. Clients seek Tim’s counsel in connection with merger and asset purchase agreements, joint ventures agreements, technology licenses, and other transactions. He also supports the IP risk-management objectives of several companies by managing product clearance and legal opinion projects and providing guidance in the design-around process. Tim served as Fitch Even's Managing Partner from 2010 through 2016 and is currently a member of the firm's Executive Committee. United States Gypsum Co. v. National Gypsum Corp. (D. Del. 2017–18). Lead counsel representing USG in pursuing claims of infringement against National Gypsum under numerous patents directed to gypsum wallboard manufacturing technology. National Gypsum Corp. v. United States Gypsum Co. (PTAB 2017). Lead counsel representing USG in seven IPR proceedings filed against patents directed to gypsum wallboard manufacturing technology. After submission of patent owner preliminary responses, obtained PTAB decisions denying institution of trial in all proceedings. Industrial Print Technologies v. Hewlett-Packard Co. et al. (N.D. Tex. 2015–18). Lead counsel representing the plaintiff in a patent infringement action involving multiple patents related to high-speed industrial printing. Seven separate actions are consolidated for pre-trial discovery and claim construction. Limestone Memory Systems LLC v. Micron Technology, Inc. et al. (C.D. Cal. 2015–18). Lead counsel representing the plaintiff in patent infringement actions related to memory chip design. Lone Star Silicon Innovations LLC v. Toshiba Corporation et al. (N.D. Cal. 2016–18). Lead counsel pursuing claims of infringement against Toshiba, Micron, Nanya, UMC, Renesas, and SMIC under multiple patents related to semiconductor design and fabrication. Transcenic, Inc. v. Nokia Inc. (N.D. Ill. 2016–17). Lead counsel pursuing claims of infringement against Nokia under patent relating to spatially referenced street-level imagery for automobile navigation systems. Case settled during discovery. Google Inc. and Apple Inc. v. ContentGuard Holdings, Inc. (PTAB 2015). Co- lead counsel representing ContentGuard in 35 IPR and CBM proceedings filed against its digital rights management patent portfolio. Five proceedings dismissed voluntarily. After submission of patent owner preliminary responses, obtained PTAB decisions denying institution of trial in all but one remaining proceeding. Ex Parte Reexamination of Transcenic Patent (USPTO 2015). Lead counsel defending Transcenic’s spatially referenced imaging system patent (U.S. RE42,289) against reexamination challenge filed by Google Inc. After submission of patent owner response and expert declaration, obtained certificate confirming validity of all claims without amendment. Transcenic, Inc. v. Google, Inc., et al. (D. Del. 2011–15). Lead counsel pursuing claims of infringement against Google, Microsoft, and AOL under patent relating to spatially referenced street-level imagery for Web mapping applications. Obtained favorable claim interpretation ruling leading to settlements with two defendants. Defeated Google's non-infringement and invalidity summary judgment motions, and obtained summary judgment against lack of ownership defense. Prevailed on Google's Daubert challenge to novel damages model apportioning search advertising revenue to accused Street View feature of Google Maps. Case settled on the eve of trial. TK Holdings Inc. v. CTS Corporation and CTS Automotive Products (E.D. Mich. 2008–14). Lead counsel pursuing declaratory judgment claims of non- infringement and invalidity of patents relating to automotive seat weight sensors. Obtained summary judgment rulings that TK Holdings' sensors do not infringe and that the asserted patents are invalid for multiple reasons. Safeway, Inc. and The Kroger Co. v. Kroy IP Holdings, LLC (PTAB 2014). Co-lead counsel representing Kroy IP Holdings in IPR proceeding filed against its digital incentive program patent, U.S. 7,054,830. After submitting patent owner preliminary response, obtained PTAB decision denying institution of trial. Outside the Box Innovations, LLC v. Travel Caddy, Inc. (Fed. Cir. 2012). Lead counsel representing patent owner in appeal from district court judgment of partial infringement, invalidity, and unenforceability of patents directed to tool-carrying bags. After assuming representation from another firm, obtained reversal of both grounds of inequitable conduct, vacator of invalidity ruling, and affirmance of infringement ruling as to one product. Software Restore Solutions, LLC v. Apple, Inc., et al. (N.D. Ill. 2010–11). Lead counsel asserting claims of infringement against more than 20 software application vendors under patent relating to automated application configuration fault detection and repair. Successfully licensed all defendants, generating substantial royalty income. Cheah IP, LLC Portfolio Monetization Project (2009–12). Led litigation and licensing program under patents directed to automated profile exchange technology for social networking website. Obtained substantial litigation settlement; strengthened portfolio through continuation practice in USPTO; brokered portfolio sale to leading social networking company. Alexsam, Inc. v. Best Buy Co., Inc., et al. (E.D. Tex. 2010–13). Trial counsel in jury trial consolidating various defenses of invalidity asserted by seven major retailers against patents for activating stored-value cards at the point of sale. Obtained jury verdict affirming validity of the patents. Obtained substantial settlements thereafter. Ex Parte Reexamination of Alexsam Patents (USPTO 2011–12). Co-lead counsel defending Alexsam stored-value card activation patents in six reexamination proceedings instituted by litigation defendants. After submission of patent owner responses and expert declarations, obtained decisions confirming validity of both patents without claim amendments. Alexsam, Inc. v. NetSpend Corporation (Travis County Dist. Ct., Tex. 2007–12). Trial counsel in jury trial of claims for breach of license agreement under Alexsam stored-value card activation patents, resulting in $18 million verdict. Trial counsel in subsequent bench trial addressing potential reduction of verdict under most-favored licensee provision of license agreement. Prevailed in bench trial, resulting in $24 million settlement. Alexsam, Inc. v. IDT Corporation (E.D. Tex. 2007–11). Trial counsel in jury trial asserting claims of infringement under stored-value card activation patents. Obtained jury verdict resulting in plaintiff’s judgment of $10.1 million. Argued appeal to Federal Circuit, resulting in affirmance of patent validity and partial affirmance of infringement verdict. “The Impact of IPRs and CBMs on Patent Litigation,” American Intellectual Property Law Association, Minneapolis, Minn., May 18, 2016. “Is the Patent Sky Falling? A Candid Review of Recent Supreme Court Decisions and Their Impact on U.S. Patent Litigation,” ABA Section of Intellectual Property Law 30th Annual Intellectual Property Law Conference, Bethesda, Maryland, March 26, 2015. “Patent Enforcement in the U.S. Food Industry,” Food Process Innovations Conference, Helsinki, Finland, May 15, 2009. “Opinions of Counsel In Light of Broadcom v. Qualcomm,” Fitch Even Webinar, April 23, 2009. “Important Trends in Obtaining and Enforcing U.S. Patent Rights,” Japanese Group of the AIPPI, Tokyo, Japan, March 3, 2009. “Update on U.S. Patent System,” TAP Pharmaceutical, Lake Forest, Illinois, December 7, 2007. “Markman Claim Construction Proceedings,” Kraft Foods, Inc., Northfield, Illinois, September 29, 2004. “Preparing Patents with an Eye Toward the Courtroom,” Xerox Corporation, Rochester, New York, June 18, 2001. “Patent Litigation in the United States,” UPM-Kymmene Corporation, Valkaekoski, Finland, February 10, 2000. “Drafting Claims for Winning at Trial,” Hoffman, Eitle & Partner, Munich, Germany, November 11, 1999. “Patent Enforcement in the United States,” in Patent Enforcement Worldwide, 3rd Ed., Ed. Christopher Heath (Oxford: Hart Publishing, 2015). Maloney, T.P., Kaba, R.A., Krueger, J.P., Kratz, R., and Mitchell, C.J., “Intellectual Property in Drug Discovery and Biotechnology,” in Burger’s Medicinal Chemistry and Drug Discovery, 7th Ed., Eds. D. J. Abraham and D. P. Rotella. (Hoboken, N.J.: Wiley, 2010). “The Enforcement of Patent Rights in the United States,” in Patent Enforcement in Selected Countries. (Max Planck Institute for Foreign and International Patent, Copyright and Competition Law: 2000) (published in four languages).